Suspiria is a 2018 supernatural psychological horror film directed by Luca Guadagnino with a screenplay by David Kajganich, inspired by the 1977 Italian film of the same title directed by Dario Argento. It stars Dakota Johnson as an American woman who enrolls at a prestigious dance academy in 1977 Berlin that is run by a coven of witches. Purchase SUSPIRIA on Blu-ray Today! The remake of SUSPIRIA titled the same as Dario Argento’s classic was well received by major critics. Snubbed by the Oscars in which one would assume a possible nomination for make up or original score would have happened. The score featured Radio Head’s lead man Thom Yorke where it was his first feature film score. I think he did a fabulous job all things considered. Which its quite hard to fill the shoes of legendary Goblin from Argento’s SUSPIRIA let a lone other films they did the score too as well. Luca Guadagnino, the Director of SUSPIRIA had quite the vision by showcasing a visceral SUSPIRIA that focused more on the witches and witch like dances of choreography at the studio. A polarizing film that felt more dry, dreary, and muted in colors of the sets most of the time which made you feel more immersed in a scary like environment. Some dark scenes with the dances and colored lights felt more compelling in contrast to the rest of the drab like shots of the film. 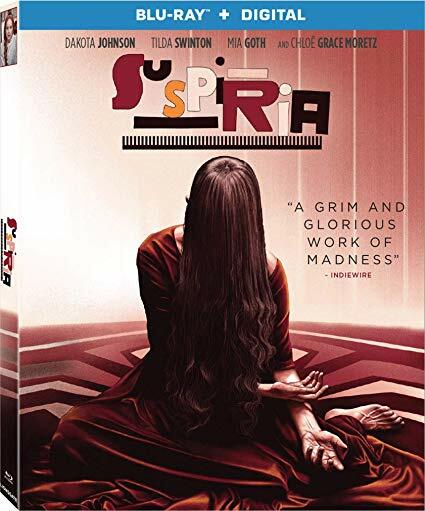 This is not a knock of the film, just one that played out quite differently compared to the original and thus really created Luca’s own version of SUSPIRIA which in turn since it was well done made it out to very neat to have another film of the same name and concept that can stand on it’s own. Both SUSPIRIA’s are worth a watch and actually worth owning if fans of the horror genre. SUSPIRIA comes to blu-ray with a stellar 1080p transfer with full colors and rarely any unintended grain. Nothing to complain about in the video quality department only that I wish their was also a Ultra HD Blu-ray Release. SUSPIRIA comes to blu-ray with a tantalizing Dolby Atmos track that is just as eerie as it is creepy. Immersive audio, and definitely sets the tone and mood in which as mentioned above Radio Head’s lead singer took on the project of the score for the film and did a fantastic job. I would highly assume this isn’t the last time we will see his work in Hollywood. SUSPIRIA comes to blu-ray with the following special features, and a digital copy.